Con Phung Islet is located on Tien River, Tan Trach village, Chau Thanh commune, right at the gateway of Ben Tre Province, which is 12 kilometers (road) or 25 kilometers (river) apart from the centre. The total area of the Islet is 50 hectares. The main means of earning for living of the locals here are planting fruit trees and making handicrafts from coconut trees. 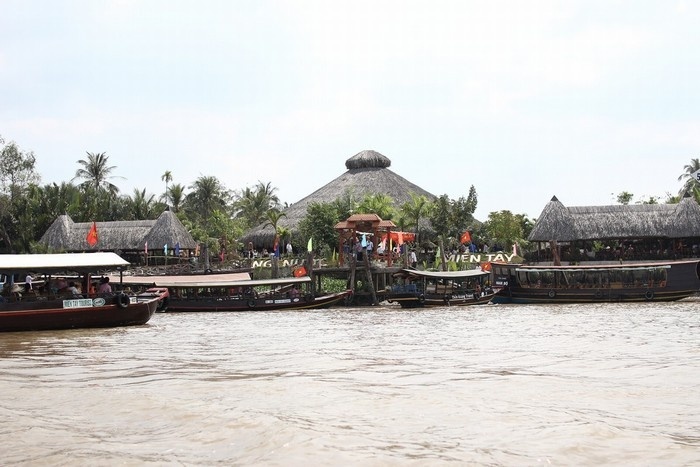 On this Islet, tourists can travel around by motor boats, visit coconut candies and handicrafts (made from coconut trees and shells) manufacturing base. Or you can experience the feeling of sitting on horse drawn wagons to visit the fruit orchards. 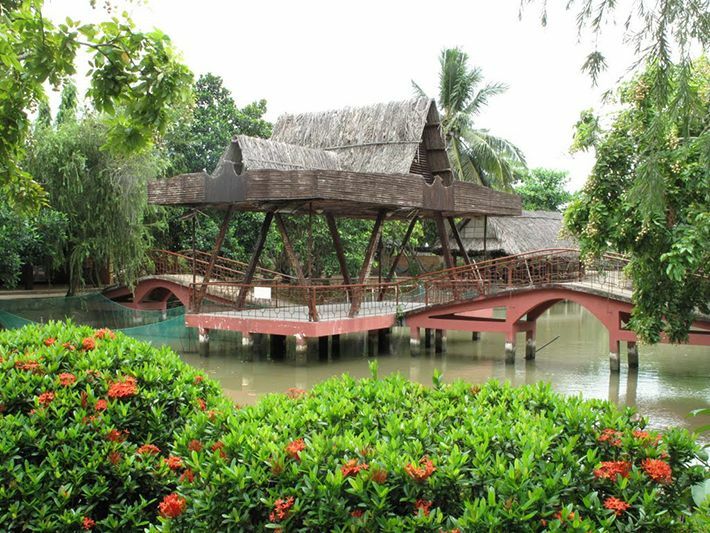 When you’re tired, you can easily find a place to rest in a thatch coconut leaf house, drink tea made from honey and kumquats, taste some tropical fruits and listen to “Don ca tai tu” (an instrumental and vocal traditional music which arose in South Vietnam. The most noticeable thing about Con Phung is that you will learn about one strangest religious shrine in Vietnam-Coconut religion found by scholar Nguyen Thanh Nam, or Coconut Monk called by the locals here. The relic has a total area of about 1,500 meters square. All the architectures from the Coconut Monk period have been preserved up till now, including: the Nine Dragons courtyard, the Peace Tower or nine-floor tower (Cuu Trung Dai-where the Coconut Monk taught Coconut scriptures and practiced rituals) and a large urn. The Peace Tower has a bizarre engineering with fragments of plates, dishes, cups carved with dragon and phoenix images. Nguyen Thanh Nam called himself a “Peace Ambassador” and his purpose of establishing the Coconut religion is to bring peace for every religion. The main policy of this belief was to combine the essences of different religions such as Buddhism and Christianity. During the time here, he just ate fruits, especially coconuts but nothing else. There are countless and various souvenirs here: from green-red masks, photo frames, 3-wheel vehicle, to cookware such as: small bowls, big bowls, plates, knives, spoons and so on, all of which made from coconuts. 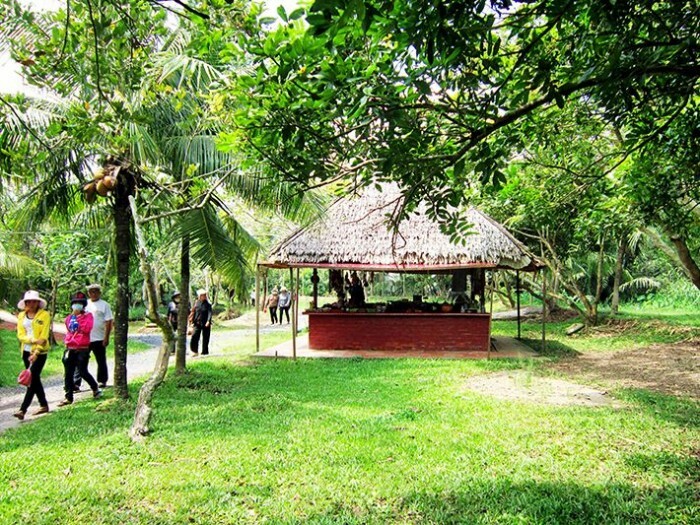 On Con Phung Islet, tourists can also explore the fruit orchards and taste some most delicious specialties of the area. Additionally, you will be captivated by the daily lives of the locals here linked with handicraft making and of course the main material is coconut tree, such as: coconut candies, gifts made from coconut trees and shells. Con Phung is enriched by both the Nature and Human’s hands. Hence, it is obviously an attractive sites for both domestic and international tourists to immerse in the vast green and impressive space here.